Students with or without musical background create, notate, and hear their very own music performed by Philharmonic musicians – often the full Orchestra – with the help of Philharmonic Teaching Artists serving as mentors and scribes. New! This year, two Very Young Composers students got the opportunity to have their music played by the Orchestra at the Concerts in the Parks concert in Central Park — what an experience! Read more about Camryn and Jordan in the The New York Times (PDF version) and listen to their pieces below. And be sure to check out the Orchestra play new works by our Very Young Composers at the Young People's Concert next season! An afterschool program through the School Partnership Program for grades 3-5 that exposes students to the instruments of the orchestra, nurtures their inherent creativity, and culminates with original works performed by members of the Philharmonic. As they move on to middle school, many students who have taken VYC want to develop their musical skills. The Composer's Bridge gives them this opportunity by fostering technical and creative independence and providing opportunities to compose music for the Philharmonic and other events. The VYC idea is rapidly catching on. It has reached children on four continents in countries including Korea, China, Japan, Venezuela, Spain, and Finland. VYC students in various American cities are exchanging "musical postcards" with these children. In fall 2011, students in New York had the chance to compose for both Korean and western instruments, in a collaboration with Korea Arts and Culture Education Service. The music they created fuses two sound worlds in individual ways. Watch now. In 2013, students in New York began a musical correspondence with students in Fukushima. They traded images of life in New York and Fukushima, and then orchestrated the pieces. 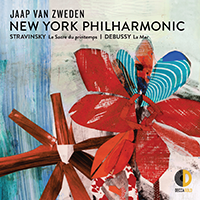 Audiences got to hear their performed by the full New York Philharmonic at a Young People’s Concert in New York in February 2014, and then in Tokyo when the Philharmonic traveled there the same month. The students from Fukushima attended and received a huge ovation! If you would like to learn how to work with student composers, or let us know about your own Very Young Composer, contact us at vyc@nyphil.org. Additional funding is provided by Muna and Basem Hishmeh; Mr. and Mrs. A. Slade Mills, Jr.; The Rochlis Family Foundation; The ASCAP Foundation; the Solender Family Funds; the UJA-Federation of New York; and The West Family.